This chapter covers the part from Életot until the river Seine. (KVA F) Following the coast from Fécamp we encounter some batteries, strongpoints and the big radarsite on Cap d'Antifer. At Ecqueville we enter a second defence line north of the Festung Le Havre. 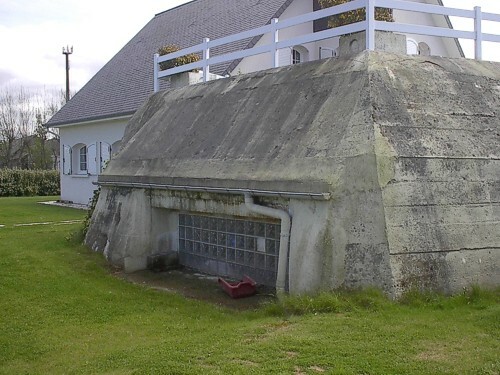 The real start of the Festung at the coast, is at a small village called la Brière. We follow the Landfront from there untill Fontaine-la-Mallet in the east. The Seefront of Le Havre was visited at the batteries Goldbrunnen, Le Corvée, the area Sainte Adresse and the harbour entrance. There are four Stützpunktgruppen: Nord, West, Süd and Ost. A capital specifies the location: K for Küste (coast), L for Landfront and H for Hafen (harbour). Visits were made in 2002 and 2007. Addional pictures Henk Adriaanse, 2010 and 2014. 677 in the Landfront at La Bruyère, re-used as a garage.